1.) Anglicized form of Máire. It has also been associated with Gaelic mór meaning "great". 2.) Feminine form of Maurus, Latin name which meant "dark skinned". Pax means "peace" in Latin and in Roman mythology this was the name of the goddess of peace. Scent: Incense, tea, smething forbidden. NOTE: Maura is blind. She pretends like she is not. Coddle her at your own risk. The first noticeable attribute about Maura is that she is quite short. Slightly below average in height, the mare lovingly calls herself "diminutive, but not frail." Far from frail, Maura is rather heavy-set and stout. She'll tell you that she's as wide as she is tall, though that isn't entirely the case. 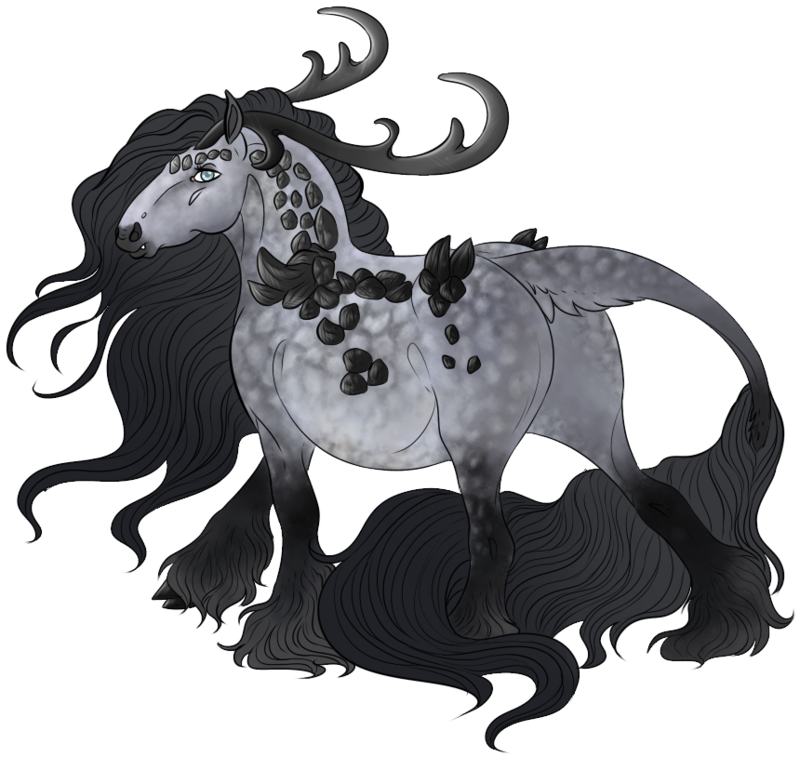 Thick limbed and curvaceous, Maura's frame favors a heavier draft-like build instead of the willowy feminine frames of her Kirin sisters. Similarly built like a Gypsy Vanner, Maura even sports thick black feathering on her compact legs. Her extra weight is not muscle....it is fat. Maura carries around a little extra fat, unlike most other horses. (She likes her sweets, okay? Don't judge a lady!) She is unsurprisingly unperturbed by her extra weight and embraces her slightly overweight body. Blanketed in a soft steely grey, lighter grey dapples all along Maura's coat. Certain points are a light grey than others, such as her face and underbelly. Black smudges her muzzle and the tips of her ears, and each leg is dipped in a deep black stocking. Light grey dapples mottles her black stockings, making them look disorderly and messy. Black cloven hooves peek out from underneath her voluminous featuring. Black antlers curve from Maura's forehead, flowing backward towards her neck before ending in gentle curls. All the prongs of Maura's antlers end in curves or curls, depending on their state of growth. Rocky obsidian growths follow along Maura's neck, shoulders, spine, and hips - all are of various sizes, though the largest formations are on her shoulders and hips. Smaller obsidian growths dot along Maura's forehead to come together in a V-formation. Small fangs protrude from Maura's lips but seem to be non-threatening. Her eyes are pale, but cloudy glacial grey-blue. Their cloudiness reveals Maura's blindness, though she refuses to be coddled for her "issue". First and foremost, never ever try to baby Maura for her blindness; it'll draw an ire unexpected from one of her stature and is the easiest way to send the stout mare into a rant. She firmly believes she is normal and she doesn't need your help, thank you very little. Mentioning Maura's blindness to her will likely draw a sarcastic response, ("oh, is that why it's so dark?! "), or a scathing remark. Maura doesn't see her blindness as a disability, for she's too stubborn to let something as measly as eyesight hinder her from living life to its fullest. Maura has zero patience for lollygagging or the "stuffiness" of courtly life and much prefers to live on her own. Generally, Maura has very little patience for anything and will often get snippy once she's reached the limit of her nonexistence patience. She will never beat around the bush or sugarcoat things for you, either. She'll be straightforward, (even perhaps a bit painfully blunt,) but everything she says is the truth. Maura hardly ever lies and doesn't like to do it even if she has to. Despite her cantankerous attitude and occasional callousness, Maura is deceptively soft. All bark and no bite, Maura has a very large heart of gold underneath her sarcasm and obsidian scales. The kirin mare also has the flair for the arts. But, instead of creating things with her arcana or her hooves, Maura sings. She believes words can be just as beautiful as any sculpture, painting, or glimmering gemstone. It became quickly apparent that even though Maura was healthy, she was hindered. She was born into a world of darkness, having never had the opportunity to see the vibrancy of life outside the womb. She was blind and her parents knew there was no remedy to fix it. Maura grew in the safety of her family unit and others who her parents were close to, including another couple with a half-kirin child. Though he was older than her, Maura often trailed behind Davaros as a younger sibling would. He kept her safe when she would stumble, tried to teach some form of patience when her frustration would grow and has generally been Maura's rock when the world went belly up. With her parents gone and a world unknown, Maura continues to push her own boundaries to experience more of what Fimbulvetr has to offer. Apprentice: The most basic level of Maura's arcana, she can only control small amounts of water at any given time. Maura can use water to help her "see" the world around her, but it does not provide a clear picture. Instead, everything is hazy and distorted. Maura must be in direct contact with water (i.e. in a pool, pond, etc) in order to "see". Large amounts of water allows her to see more easily while having less water to work with makes the task harder. Maura tires easily when trying to "see". Adept: The most notable change is that she can "see" for longer periods of time and control water without tiring. Maura can control a slightly larger amount of water. She requires less water to "see", but still needs access to water. At this stage, Maura can sense others via the blood coursing through their body but cannot directly pinpoint their location. Maura can summon small water elemental minions to aid her. Master: Maura can sense the presence of water and possibly gain detailed information about the water she is sensing, including the amount/size of water she is sensing and whether it is hidden. She needs significantly less water to "see" and no longer needs to stand in pools of water to do so - instead, Maura can see via carried skins or bottles of water. Her ability to sense others via their blood has also grown, allowing Maura to pinpoint other creatures with ease. Virtuoso: Now without any taxation upon her energy or consequences against her physical wellbeing, Maura can control terrifying amounts of water. She can now easily bend water from nearby locations or underwater springs, no longer needing direct access to water in order to use her arcana. Maura's water elemental minions have also grown larger in size, now the size of a large pony. Bits and Bobs: Maura can be found decorated in odd trinkets and baubles at random times, depending on where she is and how far she has travelled. Maura does not have a companion yet.